Cloudy and windy. Periods of rain this morning. High 53F. Winds N at 25 to 35 mph. Chance of rain 100%. Winds could occasionally gust over 40 mph.. Mainly clear. Low 37F. Winds N at 20 to 30 mph. Higher wind gusts possible. On Saturday November 17, 2018, Karen Lee (Craig) Tatman of Las Vegas NV, formerly of the Monticello, IL area, loving wife and mother of four children passed away at age 77. A memorial service will be held in the spring 2019 in Illinois. 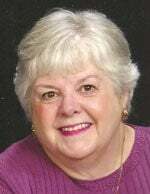 In lieu of flowers, donations can be made to the Monticello United Methodist Church – Food Pantry in Karen’s name. Karen was born October 23, 1941 in Monticello, IL to Paul and Marjorie (Bentley) Craig. She is a Monticello High School Class of 1959 graduate and on July 26, 1959 married John A. Tatman Jr. They raised three daughters, Margaret, Jonna and Karri and one son, Christopher. Karen had a passion for athletics. She was an accomplished bowler and a member of the Illinois State USBC Women’s Bowling Association in which she was inducted into the Hall of Fame for her contributions. Karen also had a talent for crafting and crocheting; creating unique pieces for her family and friends to enjoy. She was known for her quick wit and loved to talk politics. She is survived by her loving husband, John A. Tatman Jr. of Las Vegas, NV; her four children, Margaret Bunyarattaphantu of Las Vegas NV, Jonna (Scott) Graff-Fobes of Las Vegas, NV, Karri (Phil) Davis of Monticello, IL, and Christopher Tatman of Las Vegas, NV; her sisters, Linda (Bruce) Jordan of Monticello, and Paula (Tom) Highland of Sullivan; 9 grandchildren and 6 great-grandchildren, several cousins, nieces, nephews, great-nieces and great-nephews. Karen was preceded in death by her mother, Marjorie (Bentley) Craig, father, Paul W. Craig.